Leaving the Shack and operating somewhere outside can be fun – Often it gives you a better chance of hearing something distant thanks to the low noise-floor and extra space for decent/resonant aerials. I was quite late getting into “/P” myself – it wasn’t until around 7 years after I got licenced that I began to gather a “portable” kit together. 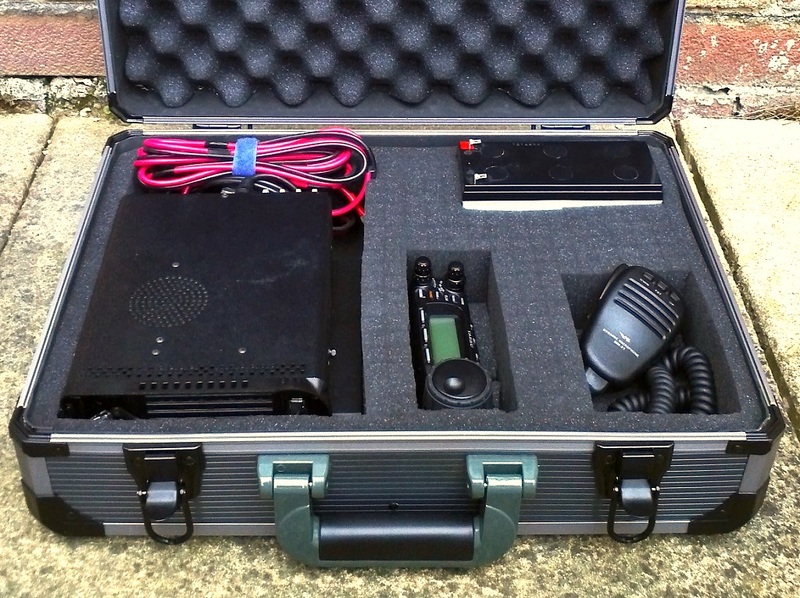 Despite the obvious requirements of a radio, aerial and a power-source – it’s amazing what else you find yourself needing! At my disposal are an Icom IC-7300 HF/6m transceiver plus a Yaesu FT-857D for excursions onto VHF/UHF. This first picture shows a summer /P setup: IC-7300 plus LDG auto-ATU and Bencher paddle. Notice the headphones – very useful when it’s windy or for when there are many callers! Power, depending upon radio in use, is via a 32Ah lead-acid battery. The 857 is sometimes combined with an LDG YT-100 auto-ATU. Aerial-wise, I often use a linked-dipole for 40m/30m/20m/17m. A length of 300-ohm balanced feeder is also used if I wish to string-up a frequency-agile Doublet. I have recently added a reel of 4x 10m counterpoise wires if I fancy trying a 40m/30m 1/4-wave vertical. A Really Useful Box – 21L capacity, for transporting most of my /P kit when I’m in the car – it also serves as a radio stand when I operate from the passenger seat during the winter: The box sits on the driver seat allowing the radio to be at a more natural operating height. Purchased June 2018 to be my main /P radio – great RX filtering, the spectrum display/waterfall and voice-keyer make it an attractive solution for a /P “session”. There’s also an LDG AT-200proII auto-ATU. All bands, all modes etc – It offers “digivox” so I can use PSK/RTTY/JT on my laptop using a simple 3.5mm to 6pin mini-DIN lead (no PTT faffing). I intend to add the Collins narrow CW filter for 2018’s /P season. There’s also an LDG YT-100 auto-ATU. Power comes from either (or both) of these – I get around 2-3 hours of SSB operating @ 100-watts with the 7Ah “brick” before significant voltage-drop occurs. I was able to flatten the 12AH after a busy 4.5 hours of use with the 857. The newer 32Ah battery is for longer operating days. It’s 115cm closed and a few cm short of 10m when extended – The dipole centre can sit on top of the 2nd section making the apex of my 40m Inverted-V around 9m up. It’s also possible to run a 40m 1/4wave vertical up the side with a little winding on the lower sections. Also works great as a simple “end-fed” vertical with a few radials. 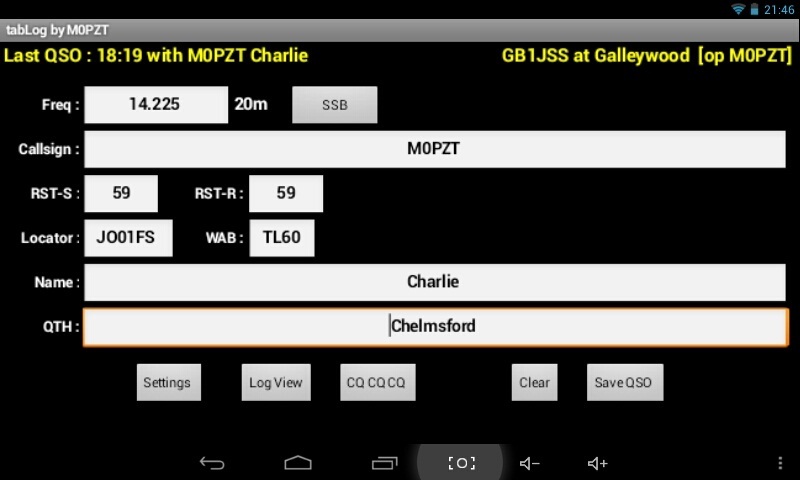 This particular one came from SOTAbeams (just over £30). I’ve also got one of their 10m “travel” poles (originally from DX-Wire). I use 1m lengths of “steel corner” aka: angle-iron to support the pole in the ground which can be purchased from B&Q here. This bag contained a modem/networking kit and it makes a great way to transport my “consumables”. There are little pockets for a dipole centre, insulators plus a zipped pouch for cable-ties and coax adapters. A further compartment houses my ground-pegs and yellow support cords. I would say that this bag is “just right” for what I use – but it’s been filled with other random bits for those occasions when you try something new or a fellow operator needs to borrow something – These /P Kit Bags from Ham Goodies will probably replace it when the zip finally gives out! I was a little late getting into the PowerPole craze – but I’ve made a series of cables which make my /P life a little easier. 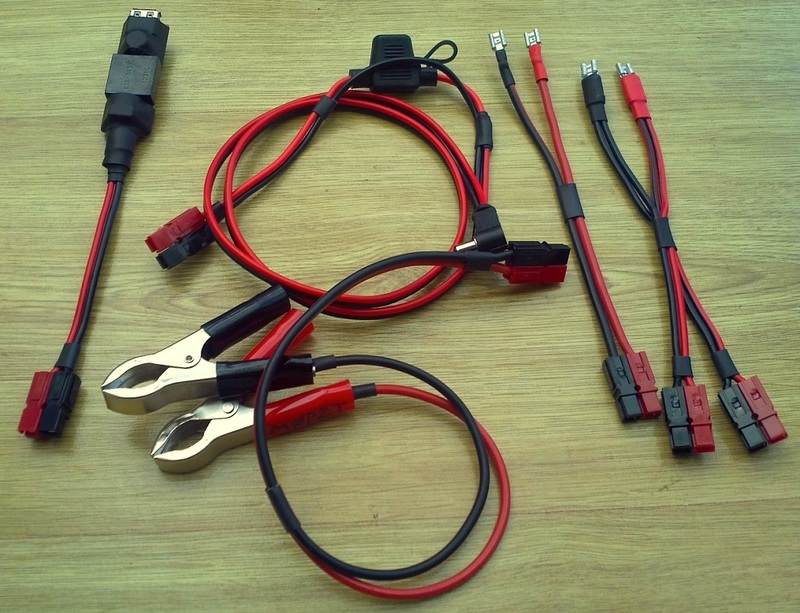 There’s a set of PowerPole leads with both spade and croc-clips which connect the IC-7300 and FT-857 my various batteries. Anderson PowerPoles are a great connector as they prevent you from connecting the polarity incorrectly. The plastic shells are common, and you can buy metal crimp/solder contacts in various ratings. 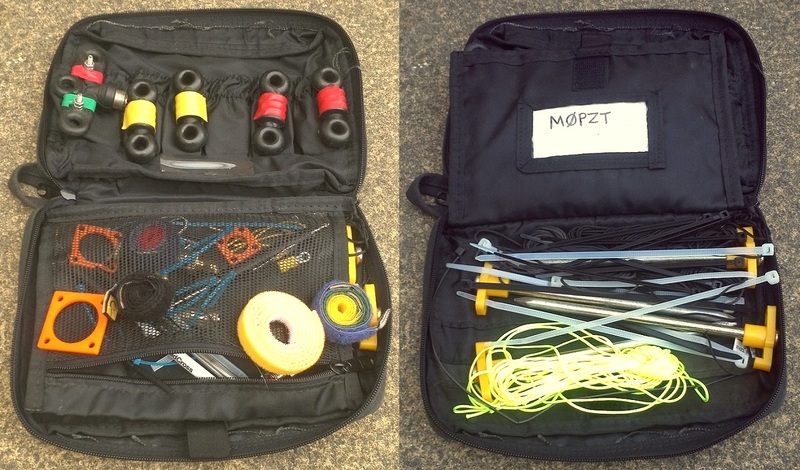 SOTAbeams do a good “ShackPack” of 12 PowerPole shells with 30A contacts and Torberry stock a range of contact-ratings and connector colours. Keeping the sun off me, and perhaps acting as a shelter if I should ever get caught in the rain – The DD Solo Tarp (2.8×1.5m) comes highly recommended. I use some cheap interlocking poles and the 4 supplied guy-lines plus pegs to secure it in this arrangement. The tarp can also be configured in a variety of other ways thanks to the numerous holes/loops. Lately, I’ve been securing one of the shorter sides to my open hatchback and supporting the other ends with the metal poles: This makes a nice operating environment as I’m close to the car, in the shade and I don’t have to keep adjusting it to keep the sun off me (and the equipment)! Another one of my creations – a logging solution for the Android OS. See the tabLog page for more details and a free download! This was picked-up from Maplin as it was on special offer at just £19.99 (reduced from £37). 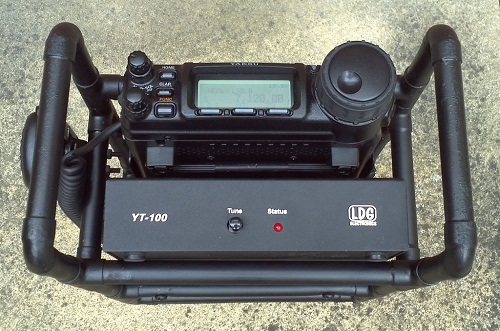 It comfortably takes the FT-857D, LDG YT-100 ATU (under the radio body) plus the MH-31, DC cable and a 7Ah SLAB. I can use the lid as a wind-break and simply attach the display and prop the radio+tuner onto the lip of the case and start operating. There’s plenty of clearance at the back of the radio to get plugs connected. An essential item for multi-station operating. I purchased this one as part of a “group buy” in April 2016 – see my blog post “We Have Filters!” for details. This style of headset is great not only for ease of transport but they are comfortable for long-term use. Sure, they don’t attenuate as much sound as closed-ear headphones but at least they don’t annoy you after 30 minutes use! I use 2 runs of RG-58 coax (12m each) and, depending upon location, either use a screw-in base or tie my 10m fishing-pole to a fence/post. It often has only the 40m wires but, when adding the 20m set (at right-angles), it becomes a self-supporting HF+VHF arrangement. Sometimes I feed the 40m wires with 17m of 300-ohm ribbon to give me a more “all round” HF Doublet – For this, I have a home-brew 1:1 Choke/Balun.